Heavily armed robbers made off with as much as $67 million worth of diamonds in a massive heist at Brussels airport, the global dealers syndicate in Antwerp told AFP on Tuesday.Monday night’s robbery was “one of the biggest” ever, a spokeswoman for the Antwerp World Diamond Centre said, adding that the diamonds were “rough stones” being transported from Antwerp to Zurich. The raid saw the gang of thieves hit a security truck from a specialist Brinks security subsidiary as the gems were being loaded onto a Swiss aircraft bound for Zurich. The AWDC spokeswoman gave no details as to who the shipment belonged to. 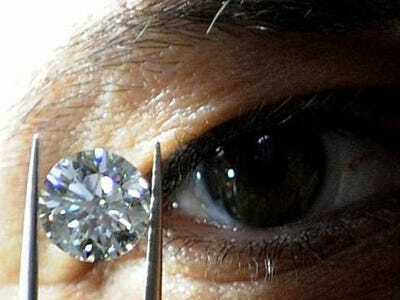 According to the AWDC, the global diamond business is worth more than $60 billion each year. Some $200 million worth of stones move in and out of Antwerp every day, the spokeswoman added. Belgian Justice Minister Annemie Turtelboom was attending a press conference at the airport late Tuesday morning. A statement from the airport earlier said the robbers drove through barriers onto the tarmac to get airside on Monday evening. Reports said no shots were fired, no-one was injured and the heist was completed within a matter of minutes. One of the vehicles was found afterwards burnt out near the airport, local police added. There are more than 4,500 diamond dealers in Antwerp, the hub for a worldwide industry going back at least 500 years, the AWDC said.